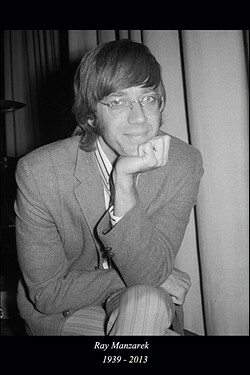 Jim Morrison sang to Ray Manzarek when they met, at Venice Beach, Los Angeles, in the summer of 1965 some weeks after both of them had finished film studies at UCLA. There and then they decided to start a band and two years later they were rock stars. Four years further on, Jim was found dead in the bathtub in Paris. And now the time has come to his former band mate, after struggling with cancer for several years. The three surviving members of The Doors never quite managed to step out of Jim's shadow after his death. But one thing is for sure, Ray's characteristic organ playing was at least as defining for The Doors sound as Jim's voice. And let's not forget his bass playing either. The Doors didn't have a bass player; instead Ray took care of the lower notes on a Fender Rhodes piano in addition to his Vox organ playing. Post The Doors he collaborated with several notabilities within American popular music, from Iggy Pop to Phillip Glass, recorded quite a few solo albums and a couple with the band Nite City. His second solo album, from 1974, has one of the best titles around: The Whole Thing Started with Rock & Roll Now It's Out of Control! Let's start by playing the first two classic Doors albums again and thank Ray for the ride!